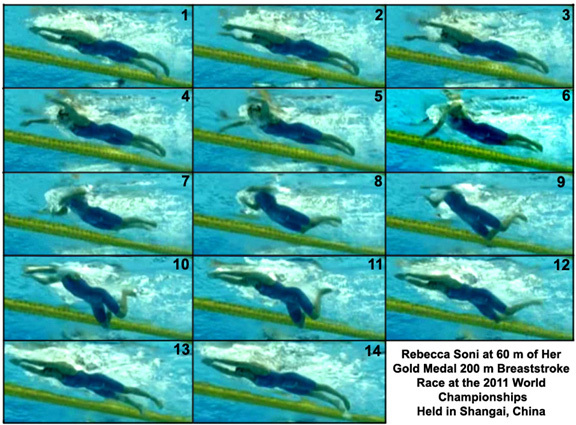 Rebecca Soni won the 2011 World Championship 200 m breaststroke race in 2:21.47. Each frame in this analysis is 0.1 seconds apart. This analysis is presented as an alternative to the style features shown in the 50 m race analysis of this swimmer. It is very likely that features of this swimmer's stroke will change with the slower velocity exhibited in this 200 m race. Perhaps this analysis will locate those differences. This stroke analysis includes a moving sequence in real time, a moving sequence where each frame is displayed for .5 of a second, and still frames. The following image sequence is in real time. It will play through 10 times and then stop. To repeat the sequence, click the browser's "refresh" or "reload" button. Frame #1: All propulsive movements have ended. The swimmer is fully streamlined. The feet are closing after the propulsive part of the kick ended with the feet wide apart. Frame #2: As the feet come together, the hands begin to spread. It is unlikely that any beneficial propulsive force would occur as the hands part. Old breaststroke theory would claim a lift force developed by an outward scull. However, at this stage of the stroke that would not occur because the hand speed would be insufficient to generate any effective force. Frame #3: In one tenth of a second the swimmer's hands have spread to shoulder width whereupon the elbows and wrists begin to bend to develop propulsive forces. Those forces are to propel a very streamlined and tapered swimmer shape. Frame #4: The arms continue to bend at the elbows as the upper arms abduct. The hands continue to spread with the pitched hands providing horizontal and vertical force components. Much of the continued spread is due to the upper arms rotating in the shoulder joint as abduction begins. This arm movement is not completely devoted to propulsion. The head has been rotated to face forward while the rest of the swimmer is streamlined. The swimmer's back begins to hyperextend and the force for the change in head position is provided by the arms through the hands. Frame #5: The pitch of the hands changes to produce a force backward. However, that force is only a component of the total force created by the arms. This is the stage of the stroke where the initiation of the shoulder/head lift occurs. Consequently, a considerable vertical force component has to be developed to support that lift. By keeping the arms angled, rather than being vertical which is required for direct propulsion, the breathing action is accommodated. The forces from the arms and the hyperextension of the back facilitate a breathing action that does not disrupt the streamline of the remainder of the swimmer. Frame #7: The hands very quickly round inward and upward. The end of arm propulsion signals the legs to initiate kick preparation. There is a hint of flexion at the knees. Breathing inhalation occurs. Frame #9: The head and shoulders remain elevated until the hands are well forward. This elevated position causes the hips to sink and the knees to sink further as the kick preparation continues. The hands are unnecessarily lifted over the water surface. Frame #10: The arms return to being covered and thrust forward underwater. The head and shoulders are pushed down. The reaction to that downward movement is for the hips to rise. The thighs are angled and frontal resistance is increased as the knees are flexed as much as they will be in this kicking action. Frame #11: The head and shoulders continue to drop toward a streamlined posture. The arms are close to full extension. The kick is initiated with the feet being turned-out (everted). The knees are apart slightly more than hip width. Frame #12: The arms are fully recovered, the last action being extension of the shoulders. The body and arms are streamlined, allowing the legs to kick against the least possible resistance caused by those anatomical segments that do not add to propulsion at this time. The knees are wide, the feet are wider still, and the propulsive surfaces are the insides of the feet and ankles. The feet gradually widen during the kick backward. They do not sweep out and around as is often taught. Frame #13: The swimmer is fully streamlined and the propulsive phase of the kick is completed when the feet are quite wide. The whole relatively direct kick has pushed a very streamlined swimmer forward. Frame #14: The feet close in together as the whole stroke cycle is completed. A position very similar to that exhibited in Frame #1 is attained and a new stroke cycle is initiated. At the end of the pull, a smaller round out should be performed so that the arms propel forward sooner than when they are partly pulled in. The hands should recover forward at an angle so that the upper arms follow in their wake. The hands and forearms should not be lifted over the surface at any time [resistance is not reduced when the hands break the surface because it is increased in another part of the body as a reaction to that movement]. The breathing action should be faster, which might necessitate recovering with wider arms moving faster and also the body rising as little as possible (only to a height that will allow safe inhalation). Both these suggested modifications would reduce the amount of resistance and energy expenditure that is required in the current stroke.